[2:28] <MikeRL> Back after a long time away. [2:29] <MikeRL> Does anyone know how to setup zram and configure it? Like how to check if it's enabled as well? [2:31] <MikeRL> I see a script that may make it work, but I'd rather learn it as I plan on using it on Ubuntu mate as well. [2:36] <MikeRL> Don't I need to enable the kernel module? [2:38] <MikeRL> Tried sudo modprobe zram and got blank output. [2:39] <MikeRL> Did't know that. So I guess zram is loaded as a kernel module. That's good. [2:40] <MikeRL> Yeah it would. There's a lot to learn. [2:40] <MikeRL> Couldn't hurt me. I plan on eventually going back to school. [2:42] <stiv> commands do return an exit status, tho. you can see it via "echo $?" [2:50] <MikeRL> Agh. Accidentally typed in the wrong size for the zram. [2:50] <MikeRL> I'll Google and see what I can find. [2:51] <CoJaBo> cluelessperson: Isn't that that cant-get-an-ip-automatically-assigned-ip range? [2:54] <cluelessperson> how do I troubleshoot? [2:54] <CoJaBo> Make sure the DHCP server is working? [5:03] <lkthomas> folks, I am curious, other than RPi, which other single board computer is well supported ? [5:37] <password2> does it not already have h.265? [5:41] <password2> what does it have now? [6:06] <password2> whats the diff? [6:38] <Galactor> Hey quick question. Anyone here use the Arcade Punks' "All Killer no Filler" 128gb arcade pack? Does it handle the N64 games well? [6:49] <pagetelegram> Hi ---- So my 2006 Xeon based Dell Precision 490 finally died (Processor issue) and have only a 2nd generation Pi to work with. I have Raspbian Stretch and looking to set it up for entertainment. Right now wondering if any youtube clients are actually working. Any recommendations? [6:50] <pagetelegram> So far I've installed Pithos. I also want to get printing working. I installed CUPS however I do not know what else to install so I'd get the add printers option. [14:57] <zautomata> what is the best Signage software for rpi3? [14:58] <zautomata> as in "most comprehnsive in terms of features" ? [15:06] <Snert> Can I just apt-get delete dhcpcd to get rid of that stupid thing? [15:08] <Snert> Maybe I'm better off disabling it somehow - keep it around just in case? How would I just disable it? [15:30] <BurtyB> Snert, you can add "denyinterface eth* wlan*" etc to the config to leave those alone. [16:00] <Snert> usually I just set the immutable bit on a config file. [16:01] <Khaytsus> ANYTHING that includes immutable bits is a hack. [16:01] <Snert> is that a bad approach? [16:01] <Snert> I use it as a quick indicator of who owns the problem. [16:01] <Khaytsus> How does that indicate anything? [16:02] <Khaytsus> And it's rarely a problem..... it's a user wanting to do something out of the design, or hasn't configured it to do their desired thing. [16:02] <Snert> if the config file stops changing and the problem goes away I know someone is changing it. [16:03] <Snert> agreed. I got good dhcp with reservations and everything is great without that thing. [16:07] <Snert> I hand out different dns servers to different groups of clients according to do they want pihole goodness, or not. [16:08] <Snert> wife devices get straight dns. [16:08] <Snert> my devices get pihole. [16:09] <Khaytsus> So you have to figure out the _sane_ way to use your own dns servers, not set immutable ids. [16:10] <Khaytsus> Or do silly hacks, which is the simply easy way and then later is going to cause you issues when somethign flips out because it can't update a file. [16:11] <Snert> that different dns thing works fine, not talking about that. [16:11] <Snert> that's all done the right way. [16:12] <Snert> on both the hardwire and the wireless vlans. [16:15] <Snert> and my internal dns is authorative for my name too. [16:15] <Snert> pihole looks to that. [16:19] <Snert> looks to me like you need to edit just about exactly as much in the dhcpcd.conf file as in the network/interfaces file. [16:19] <Snert> so whatz the gain. [16:20] <Snert> yep with a group of defined mac addys. [16:20] <Snert> these get this...those get that. [16:21] <Snert> completely different sets of info if ya want. [16:22] <Snert> yes, the name of the host is tied to the group of individual mac addys. [16:22] <Khaytsus> I wish I could use pihole here, but I can't... Of many things I do at work, one of them is the QA lead and I have to test our websites which include a bunch of tracking cookies and pixels and such. [16:25] <Snert> if you use dhcpd. [16:25] <Khaytsus> My own what? [16:33] <Khaytsus> Me too; speaking of that I've been saying for WEEKS I'm going to go around and backup all of my pi sdcards. [16:33] <Snert> I've been hammering the flash on this bbb doing dns logging for over 2 years now. [16:33] <Snert> I think I'm crazy for doing this. [16:34] <Snert> well, how big...I only need 1 version and 1Mbyte size. [16:35] <Snert> just be able to tail the incoming is all. [16:37] <Snert> I only need like a 8Mbit tempfs for bind logging. Maybe 16. [16:38] <Snert> I don't need to keep logs at all...just give me something to tail. [16:39] <Snert> and bind itself limits and rotates. [16:40] <Snert> so it would never fill up. [16:40] <Snert> it's just that I'm hammering the flash. and have been for 2 years. [16:53] <sicelo> quick question - i know the older RPis did not have analog in. does any RPI have now? [17:00] <Khaytsus> dury: why would you? What's wrong with the php in raspbian? [17:04] <Khaytsus> Install a vesrin that supports 7.0? [17:08] <Khaytsus> So your actual question is "how do I clean up a mess I made" ? [17:10] <dury> would you guys please tell me what to do? [17:10] <password8> start from scratch? [17:13] * Khaytsus waits for 1 person to say BUT I USE ARCH! [17:13] <Snert> BurtyB, thx I'll try that at least see if any side effects. [17:20] <pagetelegram> I'd like to hook up a serial modem ttyS0 for example, does the PI GPIO have pin outs for serial 9 pin adapter? [17:21] <hodapp> 9-pin? are you talking about actual RS232? [17:24] <pagetelegram> Great idea thank you! [17:42] <dury> Khaytsus, arer you there? busy? [17:46] <wonderer> is it possible todo a dd/rsync image*backup of my rpi3 to a nas share? [17:48] <Fulgen> Khaytsus: BUT I USE ARCH! [17:49] <password8> rsync should do the jub? [17:51] <r3> wonderer: I pop the sd card out of the Pi and into a reader I have on a Debian system. I then do GNU ddrescue to make an image on it (or the NAS) ... then I pop in a new SD card and put the image on it. Done. [17:56] <r3> password8: I've had more luck with ddrescue and highly recommend it... I think there is a verify step? It has been some time since I fooled with it. [18:03] <r3> I have had to do full restores from tape where some "expert" (who demanded root access) did "rm -rf /*" or similar but probably meant "rm -rf ./*" or such. That was an unhappy day ... he (and the other "experts") had his access privileges changed after that on the surviving systems. [18:03] <hodapp> are you an ex-BOFH? [18:04] * r3 stops himself from "storytime"
[18:07] <stiv> so he basically did it in Basic? [18:09] <Tenkawa> is it a exi4 filesystem? [18:10] <r3> Khaytsus: was it 8mm tape? [18:10] <Khaytsus> Yeah, I imagine it wasn't DAT.. but in a cartridge. Looked pretty much like a DAT cartridge to me really. [18:12] <schibes> Hard to imagine today but there was once a time when tape backups were state of the art bleeding edge type stuff... while I never handled them myself, I heard some pretty good horror stories about punch cards at an old job of mine long ago. [18:12] <Khaytsus> I remember when the local university installed their first backup robot. They were so proud. Literally had tours. [18:14] <r3> schibes: what really is amazing is that tape was significantly less expensive than disk, so I worked with a system that would migrate files off of disk and onto tape, leaving only a small "marker" file on the disk. The next time that file was accessed, it would be pulled back from tape. [18:15] <r3> the problem was that it wasn't that smart. So if you had someone at their workstation doing a "backup" or something, it could pull hundreds of MB (GB?) back from tape, running the filesystem out of room. [18:15] <r3> also, if your backup software wasn't properly configured and integrated with this system, the system backups could also trigger it, also running your filesystem out of room. [18:18] <r3> of course, as I was working for a tape/tape drive manufacturer at the time, we had a partnership with the morons who were pushing this software, and corporate LOVED the idea (to sell more tape drives), so we HAD to use it on the coporate network/servers. It was awful. [18:18] <Khaytsus> schibes: Never underestimate the bandwidth capacity of a station wagon full of backup tapes. [18:18] <Khaytsus> Never underestimate the bandwidth capacity of a pair of cargo pants full of thumb drives. [18:18] <r3> ok, </storytime> and </oldtimer> ... I've got stuff to do. Cheers for now! Thanks for letting me reminisce. [18:49] <dury> so "sudo apt install mod_php" then? [19:04] <dury> stiv, could you please help me, which one would it be? [19:07] <Tenkawa> which php module you looking for? [19:08] <Tenkawa> just the general one? [19:09] <Tenkawa> not from raspbian sources? [19:11] <stiv> dury, what are you using for a webserver? [19:12] <Tenkawa> toastintheshell: will hulu work yet? [19:18] <toastintheshell> so the official raspbian php package isn't up to date? [19:19] <stiv> dury, sorry? how does what do what? [19:30] <dury> stiv, which package source should I download to run make install in my case? [19:39] <dury> Khaytsus, I think it's better to remove sd-card with all system running right now, and do clean install for the beginning and install (apache, mysql all the stuff need it for joomla from source rather than repos) what you think? [19:43] <dury> stiv, which one .bz2, gz, or xz? [19:47] <dury> need to go to toilet one sec. [19:58] <dury> stiv, let's say "wget http://www.php.net/downloads.php/php-7.3.2.tar.gz"
[20:10] <dury> stiv, the thing now is to untar "php-7.3.2.tar.gz" in which directory or folder? [20:31] <Khaytsus> Why are you running a blog on your pi anyway... do you even know how to make it reachable from the internet? [20:36] <dury> Khaytsus, would you like ssh ? [20:45] <dury> so the trick is to install older joomla and WordPress, right? [20:50] <toastintheshell> man, netflix is super laggy, would overclocking maybe help? [20:58] <DanielTheFox> I told them "no torrenting, no netflix, no realtime streaming, downloading to disk and watching from disk afterwards is faster and allows you to watch multiple times"
[20:59] <toastintheshell> would more gpu memory be better or more cpu? is it the cpu handling streaming video? [20:59] <DanielTheFox> which model of RPi are you using? [20:59] <DanielTheFox> are the movies 60fps? [21:01] <dTal> DanielTheFox: what's the distinction between "torrenting" and "downloading to disk and watching from disk afterwards"
[21:02] <toastintheshell> so gpu_mem_512=256 would be best? [21:02] <pagetelegram> I play HD just fine on 2nd gen Pi, though all in ASCII with aaxine :P I am a ASCII char peeper! [21:04] <Jigsy> I don't remember the third. [21:05] <Jigsy> I also seem to be having trouble installing packages for some reason. [21:07] <Jigsy> That was it! [21:07] <Jigsy> I did have them written down, but I seem to have lost the list. [21:07] <toastintheshell> Jigsy: is that a rolling release distro you're working with? [21:09] <toastintheshell> dist=stable full=bleeding edge? [21:09] <d0rm0us3> That's the I figure it. [21:10] <Jigsy> Also, is there an equiv of gparted on Raspbian? [21:10] <Jigsy> One of my USB drives screwed up and I can't format it on windows. [21:21] <pagetelegram> heya, where do I start to get printing working under Raspbian Stretch? I installed CUPS and GutenPrint and not sure I know what I am doing. [21:23] <pagetelegram> Ok, with CUPS installed, nothing is inserted in the DE's menu to configure and add printers. Is that a tool missing that I need to install? Usually Debian out of box comes with printing already to setup. Raspbian I am not sure what I need to install. [21:24] <pagetelegram> I have the PPD file ready just not sure where to plug it. [21:25] <pagetelegram> It is an obsure laser printer, using PPD is the only known method for the linux to support. [21:25] <Jigsy> Finally managed to install higan. [21:25] <infojunky> add printer via config files, ir via localhost:631... it should prompt for driver file location, browse... add, continue..
[21:26] <Jigsy> Guessing I just needed to apt up(dat|grad)e.
[21:30] <Jigsy> How do I log in as root? [21:33] <Jigsy> Now I need to try and wipe the drive again. [21:33] <Jigsy> At which point it'll die. [21:34] <Jigsy> I guess that also explains why Wireshark never worked. [21:48] <pagetelegram> yea it is running. No prompt when I plugged in the Usb from printer. [21:50] <infojunky> else, stuck in cli and config files to resolve..
[22:01] <DanielTheFox> you said you had 2nd generation Pi, right? [22:02] <pagetelegram> Yes, the first one without the composite out. [22:02] <Khaytsus> pagetelegram: You can't use the command line for cups? [22:05] <DanielTheFox> does text browser count? [22:10] <pagetelegram> what's that netstat command arguement again for cups? [22:13] <pagetelegram> I did 'service cups start' and still not started or program not showing now, after hard reset. [22:17] <infojunky> service cupsd start ? [22:21] <larsks> pagetelegram: "journalctl -u cups" will show you log output from the cups service; maybe there are some errors there that would be useful. [22:21] <larsks> Also maybe /var/log/cups. [22:29] <pagetelegram> lot of 'create-printer-subscription' and yesterday one log for 'CUPS-get-ppds"
[22:48] <Marco-123> hi all. i've just enabled SPI on my pi with raspi-config. i've wired up my SPI SD card reader. but now i am stuck. I cannot find any tutorials or docs on this. I've found some but they seem to be for versions of the kernel that predate the SPI kernel module. my goal: simply read files from another sd card. [22:51] <ShorTie> usb adapter ?? [22:54] <Marco-123> thanks but i don't like that solution. i'd consider it as a plan b. [22:54] <gordonDrogon> Marco-123, a 2nd SD card? er..
[22:54] <gordonDrogon> wouldn't a USB SD reader be easier..? [22:54] <Marco-123> yes it would. it would also be uglier and possibly slower. [22:55] <gordonDrogon> it may be uglier, however it will be faster. [22:55] <gordonDrogon> SPI SD card reading is realatively slow. [22:56] <gordonDrogon> I've just in the past couple of days hooked an SPI SD device to an ATmega and written a lot of code for it. It's fine - usable, but not blisteringly fast. [22:56] <Marco-123> gordonDrogon: i'm gonna take your word for that. makes sense. but i still want to explore this approach. it was so easy to flip on SPI, it would be great to see this through. [22:56] <Marco-123> damn guys. you're making me want to change approach already. [22:56] <gordonDrogon> I don't know if there is a kernel filesystem module for SPI SD cards - although it would surprise me if there wasn't. [22:57] <gordonDrogon> however there is a lot of code out there to read FAT type filesystems on SD. [22:57] <Marco-123> if i use a usb adapter, it would mount the sd file system straight away, huh. no fuss. [22:59] <gordonDrogon> you'd be hard pressed to tell it apart from a normal usb data key/thumb drive thing. [23:02] <audiopath> hi, i got weird dns problems in octopi (raspbian fork) on my pi3b+, did someone else notice something like that? [23:02] <Marco-123> indeed. was hoping it would be turn-key because it looks so cool wired up! [23:17] <Marco-123> is that your project? [23:18] <gordonDrogon> yes - it's something I'm working on. [23:18] <gordonDrogon> a fun/vanity project. 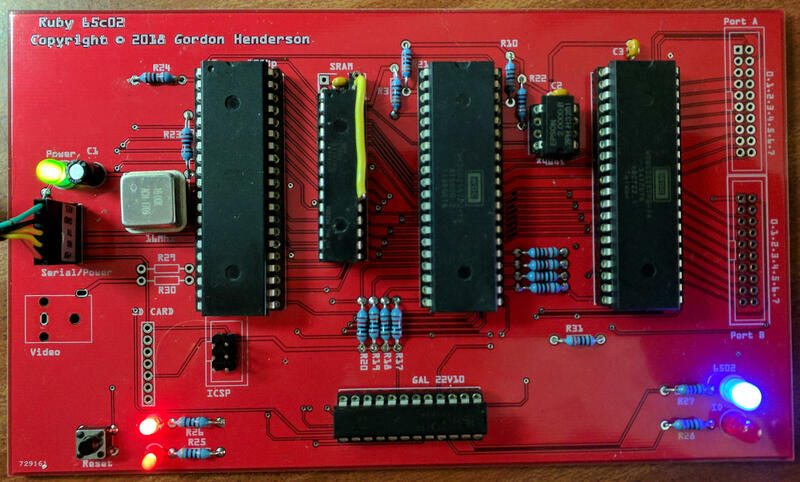 [23:19] <gordonDrogon> slightly better image here: https://unicorn.drogon.net/ruby-pcb0.jpg but that was before I soldered on the sd card voltage lever shifter thing. [23:19] <Marco-123> i dug out a sd card extension ribbon cable. makes this approach of mine seem neater. [23:19] <gordonDrogon> it's a 6502 system called Ruby becuase last year marked my 40th year of programming the 6502. [23:21] <Marco-123> what does it do? [23:21] <Marco-123> do you program the 6052 for a living? [23:22] <gordonDrogon> I did in the past. [23:23] <gordonDrogon> now, just for fun. 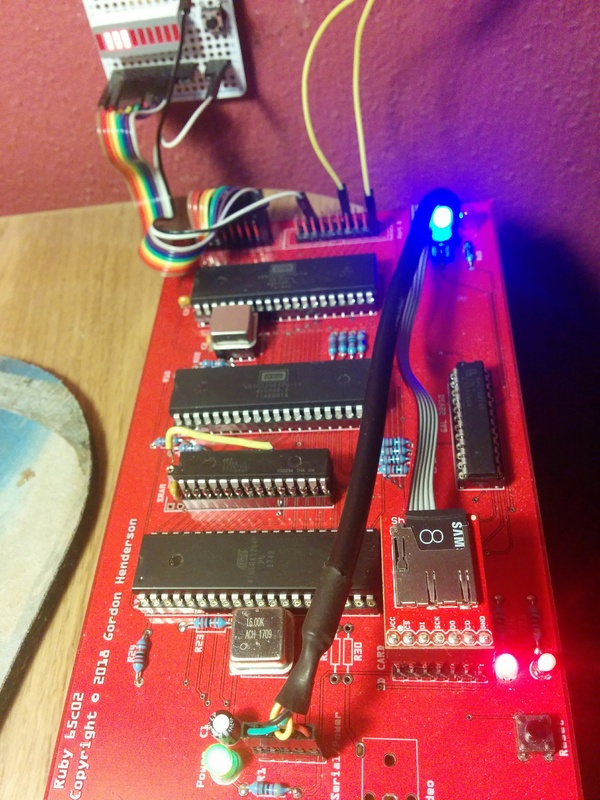 [23:23] <gordonDrogon> that board- well it runs a few different BASICs and lets me play with a 6502, although I do own a few Apple IIs and BBC Micros which were both 6502 based systems. [23:25] <Marco-123> interesting. i'm very interested in grabbing an old computer to program. i was thinking a spectrum or something. but when i discuss that with people, i only get "you will find programming those more of a chore". [23:25] <Marco-123> and the hardware is COOL. [23:26] <gordonDrogon> is was a chore, but in the late 70's/early 80's that was what we had. [23:29] <gordonDrogon> the old 8-bit micros all have C compilers for them, but they're not that efficient. [23:31] <gordonDrogon> I did it once. just once. [23:31] <gordonDrogon> I wasn't really a spectrum fan though. [23:32] <gordonDrogon> there was the great wars of the 6502 vs Z80 back then too .... Actually with a :-) almost like vim/emacs today! [23:34] <mlelstv> 6809 to the rescue ? [23:34] <gordonDrogon> one of my goals for this is to get bcpl running on it. [23:35] <gordonDrogon> mlelstv, it was nice, but too little too late for most people. [23:37] <mlelstv> TI99/4A, not exactly a calculator. [23:38] <gordonDrogon> no - tired grey cells tonight - that was the computer with the separate graphics chip/memory thing. [23:40] <Marco-123> im quite intrigued by computers that are compact but have all the necessary periphs included. [23:42] <gordonDrogon> compact computers with all the peripherals ... mobile phones? [23:46] <gordonDrogon> used it during some numerical analysis classes at uni - much to the lecturers annoyance who wanted us to iterate the calculations by hand... damn him, we were there to learn computing! [23:46] <Marco-123> ive gtg fellas. thank you for the convo! [23:46] <gordonDrogon> yea, bed time for me too..